Deviser #81812 is a total thickness 2.6 mil Aluminum Foil Tape with released liner, that is pressure-sensitive synthetic rubber adhesive coated on a 1.2 mil dead soft aluminum foil backing. 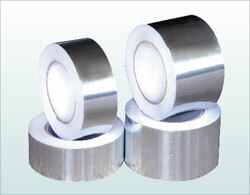 It's used for sealing joints/seams against moisture and vapor on foil jacket insulation. It's also suitable for many other permanent sealing, holding and masking application if product with foil backing is required.